Ann Pancake’s 2007 novel Strange As This Weather Has Been exposed the devastating fallout of mountaintop removal mining on a single West Virginia family. 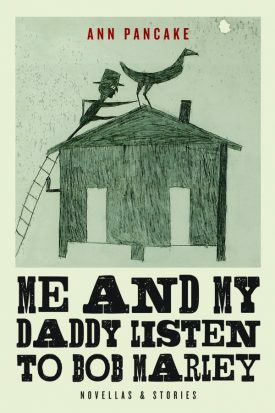 In Me and My Daddy Listen to Bob Marley, a follow-up collection of eleven astonishing novellas and short stories, Pancake again features characters who are intensely connected to their land—sometimes through love, sometimes through hate—and who experience brokenness and loss, redemption and revelation, often through their relationships to places under siege. Retired strip miners find themselves victimized by the industry that supported them; a family breaks down along generation lines over a fracking lease; children transcend addict parents and adult suicide; an urban woman must confront her skepticism about worlds behind this one when she finds bones through a mysterious force she can’t name. Me and My Daddy Listen to Bob Marley explores poverty, class, environmental breakdown and social collapse while also affirming the world’s sacredness. Ann Pancake’s ear for the Appalachian dialect is both pitch-perfect and respectful, that of one who writes from the heart of this world. Her firsthand knowledge of her rural place and her exquisite depictions of the intricacies of families may remind one of Alice Munro. Her intimate depiction of the natural history of West Virginia brings to mind Wendell Berry’s Kentucky and Rick Bass’s Montana. ANN PANCAKE is a native of West Virginia. Her first novel was based on interviews with West Virginians living in the shadow of mountaintop removal mining. Strange As this Weather Has Been was on Kirkus’s Top Ten Fiction List, won the 2007 Weatherford Award, and was a finalist for the 2008 Orion Book Award. She has also received an NEA grant, the Whiting Award, a Pushcart Prize, and the Bakeless Award for her first collection of stories, Given Ground.